A hydroponic garden can be as simple as a plant in a pot filled with rock or some other type of inert growing media, that is watered by hand. The water must contain the elements required for plant growth that the plant doesn't get from the air. Water mixed with these elements is called the "nutrient solution". The elements required for a nutrient solution are Nitrogen, Phosphorus, Potassium, Calcium, Magnesium, Sulfur, Iron, Manganese, Copper, Zinc, Molybdenum, Boron, and Chlorine. Off the shelf soil fertilizers don't contain all the elements, in the right proportions, to make a hydroponic nutrient solution. Only quality hydroponic nutrient formulas contain all the elements required. A nutrient formula can be made from scratch with a little knowledge of chemistry and what chemical form the elements should be in. But that is beyond the scope of this discussion. We will be adding a link to a book on this topic in the future. Watering a hydroponic garden by hand may be impractical with more than a couple of plants or with a growing medium like rock that will dry out in a few hours. Most hydroponic gardens have a "hydroponic system" that is automated with pumps and timers to do the work for you. Most hobby growers like to experiment with different types of hydroponic systems, often building them from parts. Here is a few of the most common systems with a brief description. A plastic tray filled with plants (usually in pots), on top of a reservoir filled with nutrient solution. 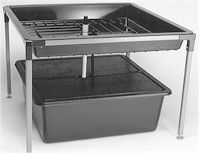 A pump in the reservoir is connected to the bottom of the tray. When the pump turns on, the tray fills with water. When the pump turns off, the water runs back down through the pump into the reservoir. The tray must be above the top of the reservoir so gravity pulls the water back down. 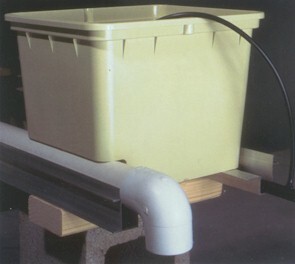 An overflow fitting must be added in the tray to regulate the depth of the flood. When the water level reaches the top of the overflow, it runs back into the reservoir. The pump can be turned on with a timer. A system like this usually waters 3-4 times a day. Drip systems can use a number of different types of containers but the operation is usually very similar. The nutrient solution is stored in a reservoir. A pump in the reservoir has tube connected to it that runs up to the base of the plant. The tube may branch off to smaller tubes feeding many plants. It works just like a drip irrigation system in your yard. In fact, you can use most of the parts available for drip irrigation systems like drippers, stakes, tubing and fittings. If the nutrient solution is going to be recovered, the containers should be above the reservoir so gravity can do the return work for you. If not, the system becomes more complex with another pump to return the water. Of course you don't need to recover the nutrient solution at all, it could just run off. This may not be the best setup if it's in your extra bedroom. Some drip systems run continuously, others are on a timer. 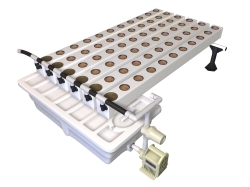 The NFT system starts like a drip system, it has a reservoir with a pump. The pump has a tube that branches off to smaller tubes to feed the plants. But, the plants are watered at the roots. The plants are setup in troughs like rain gutters. The trough has a cover with round or square holes cut out for each plant. The holes are spaced correctly for the crop. The plants are growing in small plastic baskets about 2 inches across, filled with rock or rockwool. The baskets are placed in the holes in the cover of the trough. Some systems don't use baskets just a cube of rockwool or similar growing material. The water comes in the trough at one end and drains out the other. Most of the roots will fill the bottom of the trough. The goal with this system is to get just enough water flowing all the time to keep the roots wet and also keep them exposed to the air to get the extra Oxygen. It works quite well when setup and maintained correctly. An aeroponic system looks like an NFT system but works a bit different. The plants are growing in small plastic baskets that are placed in holes cutout along the top of a tube. The roots grow down into the tube. The tube is filled with water by a much smaller tube running along the inside of the large tube. The small tube has holes cut every 6 inches or so to let the water come out. At the end of the large tube is an overflow just like the Flood/drain system that regulates the depth of the water. The large tube remains half-filled with water. The trick with this system is to have a high-pressure pump so the water coming out of the small tube sprays, oxygenating the water in the large tube. The pump should run all the time. We could go on and on with different types of systems but the basic idea is to keep the roots moist AND exposed to the air.